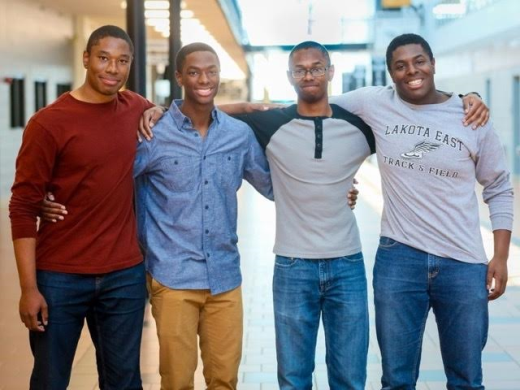 Quadruplet brothers in Ohio have all been accepted at eight Ivy League schools including Yale and Harvard and other top schools. Aaron, Zachary, Nigel and Nick Wade, 18, of the northern Cincinnati suburb of Liberty Township are drawing national media attention for their extraordinary feat. They were profiled on Wednesday on Washington Post and spent most of Wednesday afternoon being followed by a national TV network news crew during their classes. The proud sons of Kim Wade — principal of Lakota Plains Junior School — and Darrin Wade, the four have excelled in the classroom and athletics. 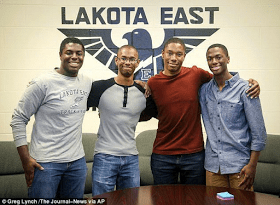 Lakota East High School principal Suzanna Davis tells the Hamilton-Middletown Journal News that the four seniors epitomize academic focus but at are well-rounded “great young men” with great personalities. The Fantastic Four haven’t made their decision, though Aaron likes Stanford University and his brothers are leaning towards Yale. The four are equally good-natured, so much so that their version of an argument is to disagree over which sibling is the smartest. Aaron is brilliant,” insists Nick. What they do all agree on is crediting their parents and Lakota teachers for helping to earn such an exciting opportunity. “We’re grateful to our parents and the Lakota school district because it’s really something we couldn’t have done on our own without all the support we have had through our lives. It has been awesome,” said Nick, who along with Nigel and Zachary are leaning toward attending Yale. “It’s really our parents our friends and our community who havte come together and taught us how to be disciplined. We feel like getting into these schools show who the people around us are,” said Nigel. Zachary added that they have always gotten encouragement that the sky the limit with their hard work.